Mustang is the ancient Himalayan Kingdom which lies in the northern central part of Nepal and at the top of the Kaligandaki River. 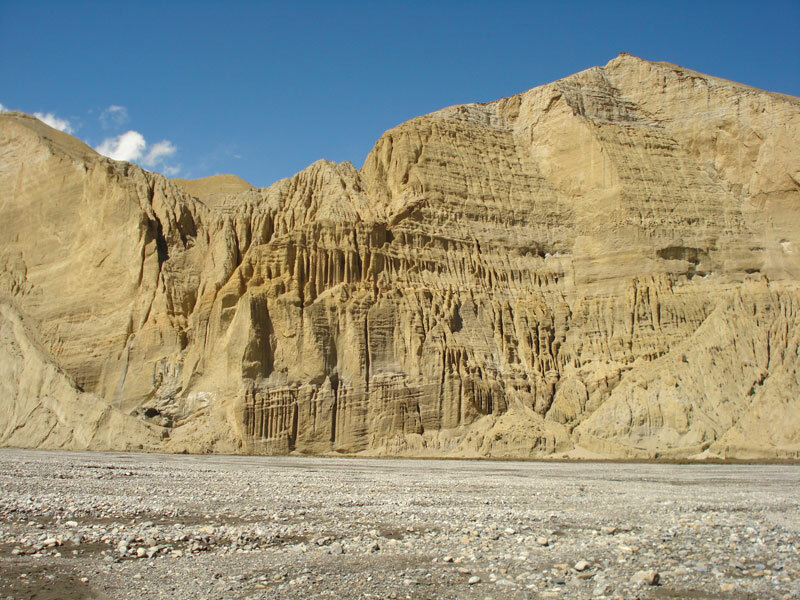 Upper Mustang consists of two distinct regions: the southern part and the northern, where the languages, culture, and traditions are similar to those of the Tibetan people. This area is considered one of the most interesting and picturesque places in Nepal. The entire area has an isolated and mystical feel to it, enchanting and inspiring visitors to this region. 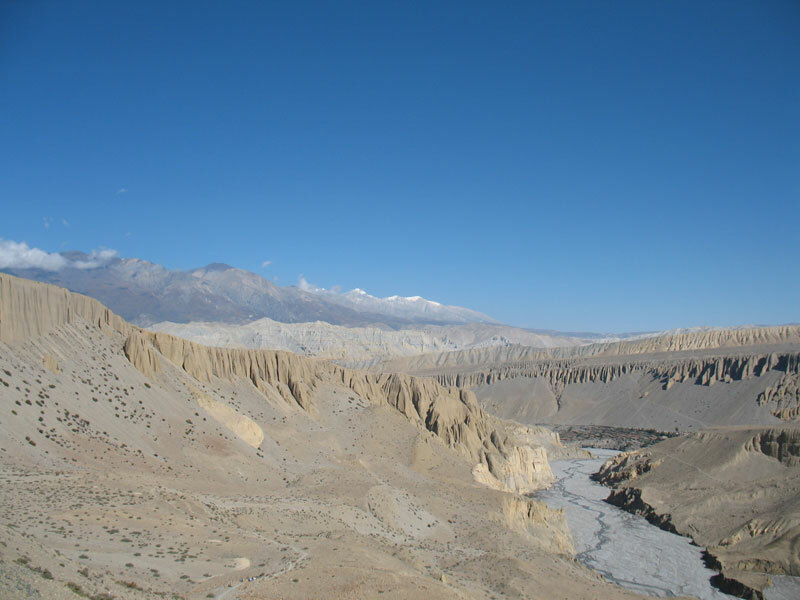 Upper Mustang Trekking (Lo- Manthang) is through high altitude desert country climbing in and out of the huge sided valley of the Kali Gandaki. In places, the gorge, which the Kali Gandaki River runs through is the deepest in the world. This region is full of some of Nepal's oldest Buddhist Monasteries, ancient and isolated villages with quaint whitewashed houses. 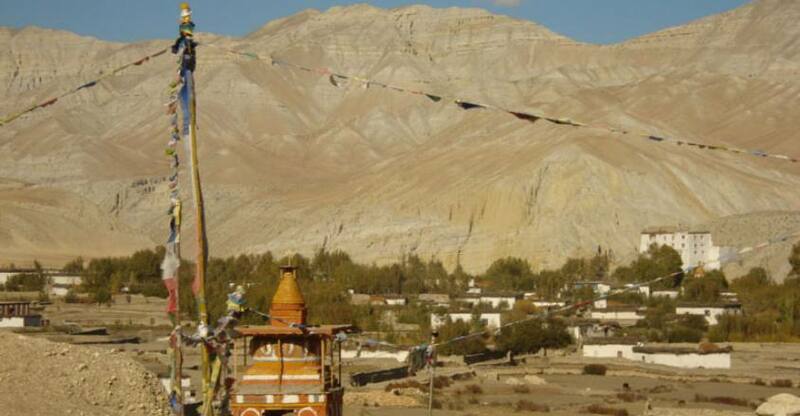 During the Trekking in Upper Mustang we can see and visit Luri Gompa and Yara/Ghara village lies East South of Lo-Manthang, Luri Gompa (Cave monastery) sits high above the crumbling landscape like an eagle's nest. It is some of the last cave monasteries in Lo and Tibet. 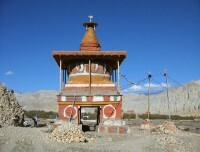 No written record exists for the construction of Luri Gompa. Luri Gompa and some other monasteries are affiliated with the Kagyu sect (one of the sects of Buddhism). The style of the painting suggests they were done by Nepalese (Newari) artists working for Tibetan patrons. The cave temple dates from the 13th - 14th century. The central chamber of the Gompa is carved out of the rock creating a domed ceiling on which are painted a series of Mahasiddha, Sakyamuni Buddha and Chenrezig figures etc, which are the true masterpieces. Lining the walls are a series of 14th-century paintings, which depict India Mahasiddahs. Some are real individual and other mythical. Day 03: Fly to Pokhara 850m. 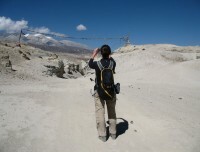 Day 04: Fly Pokhara to Jomsom and trek to Kagbeni 2800m. Day 05: Kagbeni to Chaile 3050m. 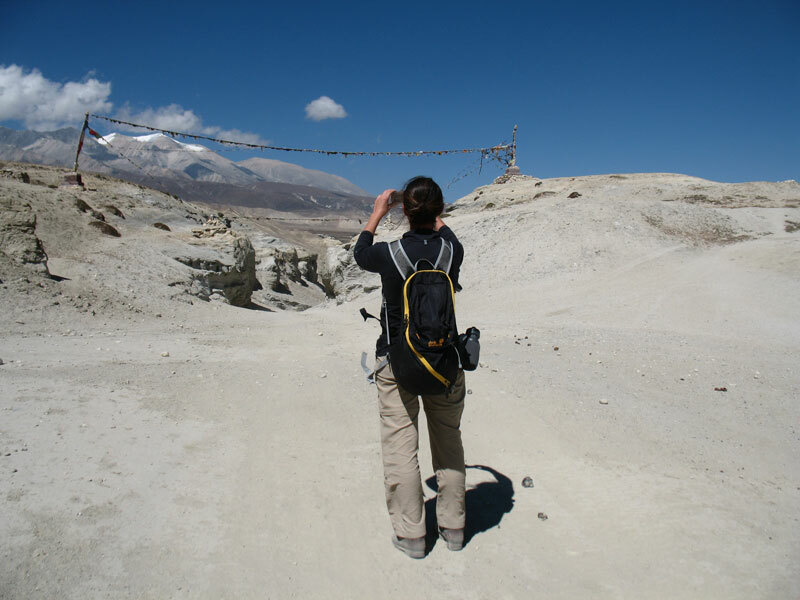 Day 06: Chaile to Ghiling 3500m. 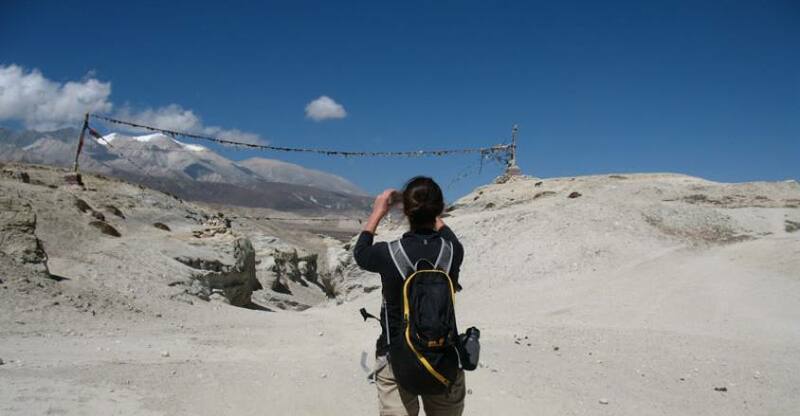 Day 07: Ghiling to Charang 3620m. Day 08: Charang to Lo-Manthang 3840m. Day 09: Lo-manthang (Namgyal Gompa and Tingkhar). Day 10: Lo-Manthang to Dhi 3410m. Day 11: Dhi to Tange 3370m. Day 12: Tange to Tetang/ Chusang 3022m. Day 13: Tetang to Jomsom 2713m. Day 14: Fly Jomsom to Pokhara 850m. Day 15: Drive back to Kathmandu 1350m. Day 16: Fly back to Home. Full board camping trek, (two mean tent, dining tent, kitchen tent, toilet tent, table chair,) nesesarry camping equipments. 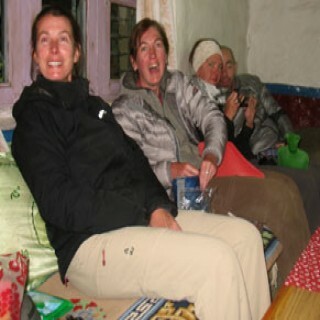 Meal on full board (breakfast, lunch and dinner) during trekking serves by our own trekking cook. trek guide and cook crows and porters. 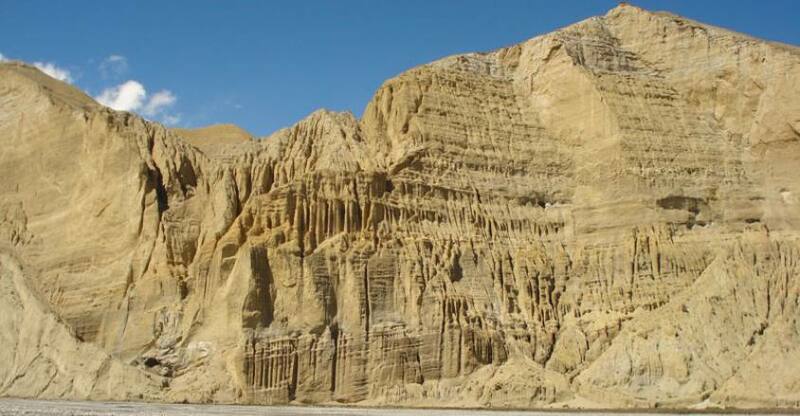 Special Trekking Permit US$ 500 per person for 10 days (the above price includes 10 days inside of restricted area Upper Mustang. Entrance fee of all sightseeing spots. you will be welcomed by our Halesi Treks Pvt.Ltd representative at Tribhuvan International airport upon your arrival, and then transferred to your hotel. Preparation for the trekking (If any stuff needed to be purchased for trekking) overnight at hotel. After breakfast fly to Pokhara, it is an opportunity to see the beautiful Himalayas range along flight. overnight at hotel. Early morning we are flying northwest from Pokhara toward the great portal between the snows covered peaks of Annapurna and Daulagiri.you will enjoy the well-raised massifs of more than 8000 meters, and the deepest gorge on this planet. overnight at tent camp. The trail leads up towards the east bank of the kaligandaki climbing over many ridges as it heads north and reaches Tangbe village. The town is a labyrinth of narrow alleys amongst whitewashed houses, fields of buckwheat, barley, wheat and apple orchards. The Nilgiri peak, dominates the southern skyline of Kagbeni, all the way by different shapes. Beyond Tangbe we reach Chhusang village in about 1 or 2 hours, then we trek and cross the river which continues north climbing up to a huge red chunk of a conglomerate that has fallen from the cliff above, forming a tunnel that the Kaligandaki follows. The trek now leaves the Kali Gandaki valley and climbs steeply up a rocky gully to Chaile. overnight at tent camp. The climb continues along steep, treeless, waterless terrain, along with the side of the spectacular steep canyon to a pass and cairn of rock.then the trail makes a long gradual descent to some chortens on a ridge, and with a further descent before coming along a pleasant trail to Samar village. We climb above Samar to a ridge, and then descend into a large gorge, which the trail goes into another valley field, crosses a stream and climbs up to a ridge at 3800 meters. the route climbs over yet another pass, follows a ridge and then descends to Shyangbochen. from there we gently climb to a pass at 3770meters and descend to Ghiling village. overnight at tent camp. From Ghiling village the trail climbs gently up to an interesting pass NYI LA and descends below the blue, gray and red cliffs. After crossing a steel bridge of the Tangmar Chu (river) you will arrive at a MANI WALL perhaps the longest and most spectacular MANI wall in Nepal. Climbing over another pass at 3600meters, the route makes a long gentle descent to Charang village. The huge five-story white Dzong and red Gompa are the main attractions to visit and observe collections of statues and Thanks as well as many large paintings, of seated Buddha's. overnight at tent camp. The is an opportunity to visit two other villages on your trek.the trail climbs steadily until Lo-Gekar. 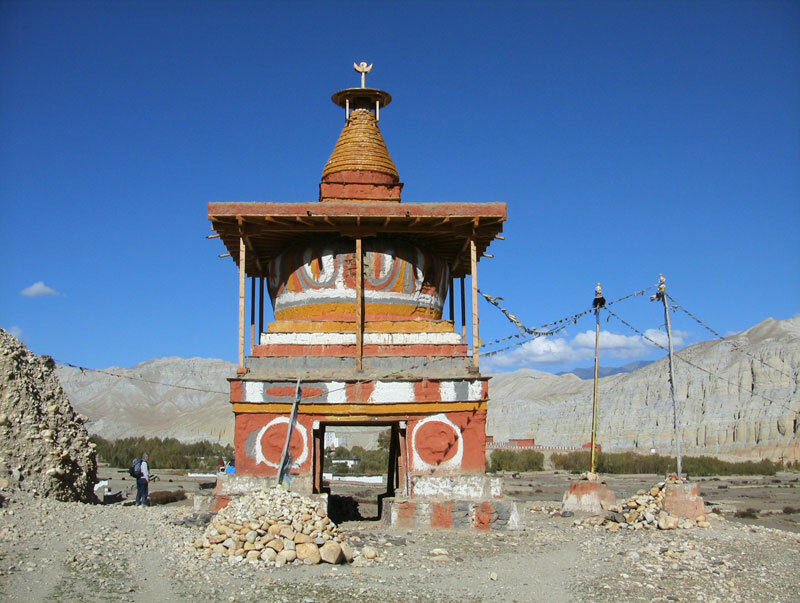 Lo-Gekar Gompa is older than Samye Gompa in Tibet and one of the oldest Gompa of Nepal. After visiting Lo-Gekar continue to trek to Lomanthang. The trail until Lo-Manthang is fine with some minor climbing. Finally, from the ridge, there is a view of the walled city of LO. After a short descent, cross a stream then climb up into the plateau of Lo-Manthang. overnight at tent camp. It takes around 2 hours to Namgyal Gompa. Namgyal Gompa situates on a hilltop, which serves as an important monastery for the local community, also serving as a local court. After visiting Namgyal Gompa continue the tour to Tingkhar, which is a village of around 40 houses, the last main village to the northwest of Lomanthang. After visiting Namgyal Gompa and Tingkhar return to Lo-manthang. overnight at tent camp. From Lo-Manthang the trail walks straight till DHI pass 4100meters and descends down to Dhi village. treks this part is harder but more rewarding and interesting than the west side of the valley. Dhi village is one of the best villages of whole Lo-manthang and it seems more prosperous and it is settled in a very suitable place. Overnight at tent camp. From Dhi the trail goes through the river for around 2 hours and crosses a river from Damodar Kunda, one of the sacred lakes, there is no bridge on the river so we need to walk across in bare feet to cross this river. After crossing the river the trail climbs up till high above a pass of 3850meters. The trail goes through a grassless, treeless bare hill. After the pass, the trail again drops directly to Tangbe village at an elevation of 3370m.Tangbe is a small village of around 30 houses but most of the houses are attached to each other. On the rooftops, one can see piles of dry woods, which also reflects the prosperity in their society. overnight at tent camp. The trail walks through a steep ridge of hills providing some fine views of the wind-carved hills. Tetang village is formed between 2 hills they should have found it a safe place to avoid the strong wind that hits the entire Kaligandaki valley. Tetang is the upper village of the Chuksang, which we visit on the first day entering to Mustang from Kagbeni. overnight at tent camp. This is the last day of the trek. The enjoy the views of the Kaligandaki valley. This is the entry point to Mustang. We get a round trip of our trek in Ekle Bhatti visiting all the surprises of the human effort in this corner of the World of such an isolation and solitude. Arrive at Jomsom to celebrate the last day of the trek, with all the trekking staff. overnight at tent camp. After the breakfast gets into the Airport it takes 20 minutes to get Pokhara. Afternoon. overnight at hotel. After breakfast drive to Kathmandu, it takes approximately 7 hours by tourist Bus. Overnight at hotel. This is your final day in Kathmandu before catching your flight to home, ensure you have all the stuff packed and arrive at the airport in plenty of time, fly to home. I had the chance to meet Man Kumar Tamang in October 2009. At that time he guided our Langtang - Gosainkunde trekking. It turned out to be an unforgettable experience. Not only because of the beauty of Nepal as a country, but also because of the excellent mountain guiding skills of Man Kumar. 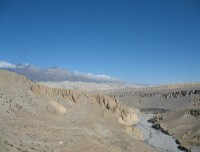 Driven by the positive experience we decided to come back to Nepal this year 2012 for a trekking in Upper Mustang. Again guided by Man Kumar Tamang and again it turned out to be an experience to cherish for life. Man Kumar not only guided our trip but also took care of the full organization - planning - booking - team selection. He is not only a reliable, highly experienced guide but also a very friendly and honest person. Even in stress situations he manages to stay focused and does whatever is in his power to come up with the best possible solution. If you consider traveling to Nepal I would highly recommend his services. You will be surprised by the warm & personal approach. Not only by Man Kumar himself but also by the selection of team members that might join you on your trip.